Velddrif - Hank McGregor triumphed over a class field and atrocious weather on the final day to claim a record ninth title in the Berg River canoe marathon. The win was an emotional one for the current world marathon champion and Team Best 4 Kayak Centre captain, as his father Lee McGregor was seconding him for the first time in almost a decade, and his team-mate and best friend Grant van der Walt had been sidelined by the stomach virus that hit the race. "This ninth win is a very special one for sure," said McGregor. "There were some class paddlers out there. On the way in 'to the finish the guys in the front four boat bunch were discussing the fact that there was a total of sixteen wins in the group. Only Lance King has not won it before and we were teasing him about needing to start to show some interest." "It was very tough out there in the wind," he added. "It was incredibly cold and the nett wind chill factor took it to a negative. That is a tough place to be in when you are locked into an endurance event like the Berg. Going into the headwind the waves were like three foot surf. It was ridiculous. I would have much preferred to be on a surfski!" The gutsy Durbanite started the final 62km stage from Zoutkloof to the West Coast fishing town of Velddrif with a nine minute overall race lead, and quickly settled into a five boat lead bunch that included podium contenders Simon van Gysen, Graeme Solomon and Lance King as well as the resurgent nineties King of the Berg Robbie Herreveld. 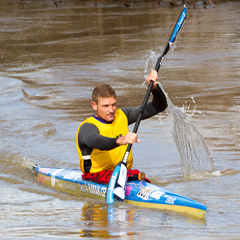 Absent from the final stage was luckless Jacques Theron, a three times winner of this race, who became another casualty of the stomach bug that derailed Grant van der Walt on the third stage and several other paddlers. Next to drop out of contention was the plucky van Gysen, whose hopes of a podium finish evaporated when he broke a rudder cable less than half an hour into the stage. He raced to the bank to repair the damage but it cost him several minutes and he lost contact with the other podium contenders. McGregor won the Best 4 bridge prize, making it a clean-sweep of the stage hotspots, as the race moved onto the flat tidal estuary that was buffeted by gale-force South Easterly winds that made wind chill a very serious threat to the paddlers in addition to whipping up big waves on the lagoon. McGregor kicked from 500 metres out with only Graeme Solomon looking like posing a threat to him. McGregor took the line honours to a hero's welcome with Solomon's sprint enough to earn him second place overall ahead of Lance King. Simon van Gysen did extremely well to claw his way back through the field after his rudder cable issues to claim fourth place. In the women's race Jen Theron snatched her first major river title with a solid performance on the final stage that included another systematic and patient chase from behind to catch the never-say-die Robyn Kime. Kime made a valiant charge early on as Theron had started with an eleven minute lead. Team Best 4 Kayak Centre athlete Kime made good use of the revised race rules that allowed the women to ride the slip waves of male paddlers in the massed start on the final stage but Theron repeated her performance of the third stage and gradually reeled her in. The pair entered the final section from the portage at Oordraplek to the finish together in a group of three other male paddlers, a striking statement about the new rules, and it was Kime who held on in the tough and windy conditions to claim the stage line honours while Theron finished with a beaming smile knowing that her eleven minute overall lead was still intact. "It made a massive difference to have the race committee allow us to race like other paddlers and ride wave on bunches," said Theron. "This race would have been truly horrible if we had not been able to ride slip, and the fact that we were able to provide such a close race I hope adds value to the event." "It will also give women a chance to strive for goals like a top twenty or a top ten overall, which will be fantastic," she added. Theron was caught up in a furious battle for the junior laurels between overnight leader Paarl schoolboy Luke Stowman and Krugersdorp talent Jandre Bezuidenhout, who battled his way back from second to claim the boys title by five minutes in a ding-dong tussle between the two juniors. In the process Jen Theron slipped out of the top twenty overall.